This is a quote from Mary Nelson who has been to Nicaragua twice in the last six months and has seen the overwhelming needs that special-needs children and their families face living in extreme poverty. Please consider joining with her by becoming a monthly sponsor today. 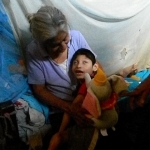 Help us join with Mary so we can we can buy more beds, food and basic needs items for the over 11,000 children in Nicaragua who need our help and give rest for the weary.